Hiroshima is perhaps most famous because it was the first place that an Atomic Bomb was dropped on a civilian population ever. The bomb, sickly named Little Boy, was dropped on August 6th, 1945 at 8:45 in the morning, by the American Bomber, Enola Gay (Cue, crap 80´s OMD pop song). I visited Hiroshima, as I wanted to find out the truth about what happened that day and also I wanted to see what the city was like today. Most foreign tourists visit Hiroshima to visit the Peace Memorial and the Peace Memorial Museum. Call it a sick, or perhaps a morbid fascination but we do want to see the devastation caused by such a powerful weapon. We´ll get back to this later. 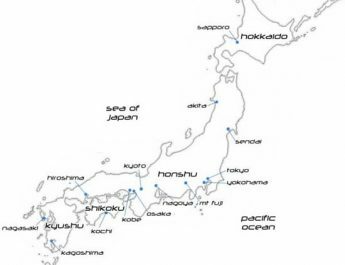 Hiroshima is to the south of the island of Honshu but not as far south as the island of Kyushu. To get to Hiroshima, from Osaka it´s a 75 minute train ride if you get the “Nizomi” (Super fast bullet train (300kph+) or 105 minutes if you take the “Hikari”. 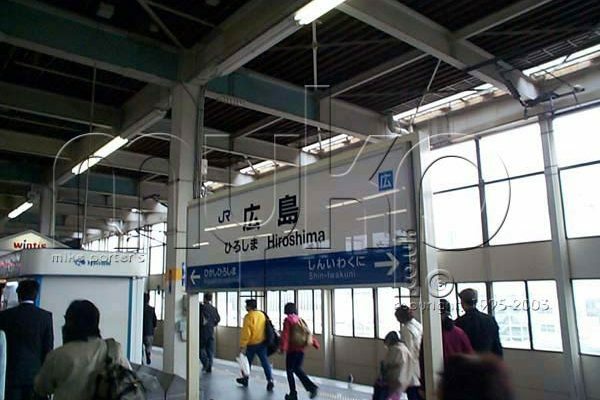 On arrival in Hiroshima, you don’t notice anything different about the city. It now looks like most other Japanese cities, Tall building dominate the skyline and there are buildings as far as the eye can see. 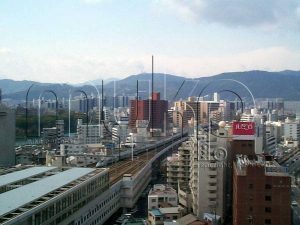 We stayed in the Hotel Granvia Hiroshima, which is ideally suited as its right next to the train station. Be warned though if you´re a smoker. The hotel is nearly all no smoking. Just one floor only is set aside for smokers. If you buy the Japanese rail pass, before you go to Japan (More in Transport in Japan). You can get discounts if you stay at Japanese Railways hotels sometimes as much as 40% off the normal price. The transportation in Hiroshima is superb. They have a extensive Street Car (tram) network which is both cheap and reliable however it can get busy at rush hours. They also have a very good bus service as well. Coupled with the train system, which can get you to some parts of the city very quickly. 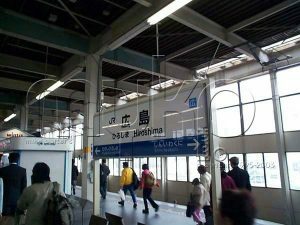 Buses and trams are the cheapest transport, starting at 200 yen (£1.14) and trains and taxis being more expensive. 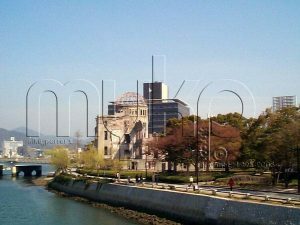 As we only spent three days in Hiroshima I didn´t see a great deal in the city but what I did see was the following. Although the castle has been rebuilt after the A-bomb of 1945 the building is almost identical to the original castle which was originally built in 1589. The castle is really a museum of the history of the City of Hiroshima and the history of the castle. The castle is a truly magnificent building and I could not but stand in awe of its size and the design of the building. Like most Japanese castles the main building is built on a large stone base, by large I mean around 30 feet high and then the castle itself is a wooden structure made of many layers. If you are going to visit, this or any other Japanese castle I might suggest you wear decent socks (Clean and without holes) as you will be asked to remove your footwear and put on a pair of special slippers to protect the wooden floor. If you have big feet you may find they dont have your size! The castle is fairly easy to get too, from Hiroshima station, Catch the no.1 or no.6 street car to Kamitacho, then it´s about 10 minutes walk to the castle. It took my wife and I about 2 hours to walk round the castle, but we took loads of pictures and stopped to look at different things quite a few times as well as some of the garden. This is a small island about 30 minutes local train journey outside of Hiroshima. 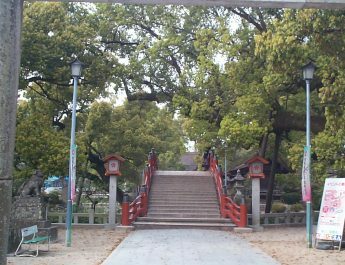 You will have to get the ferry across to the island; this takes about 15 minutes and passes the O-torii (Grand gate), which stands in the water on the sea front of the island. Upon arriving on the island you have to walk, there are a few taxis and they are expensive, or you can hire a bike. The main features of the island are the Itsukushima Shrine, which is a temple that has stood on Miyajima since 593 AD although its has been damaged by sea and fire many times. The temple stands directly on the sea front and at high tide the waters do actually lap around the many piers of the temple. The island is also home to Senjokaku (meaning “hall of a thousand mats”) (note: all room sizes are measured in tatami mats as these are a standard size of 3ft x 6ft approximately). This is a large wooden building with the shrine located in the middle of the hall. What I found especially wonderful was all the old, very old pictures, which hang from the ceiling. Some of these are so old they are barely visible. Next to the Senjokaku is a five story pagoda. 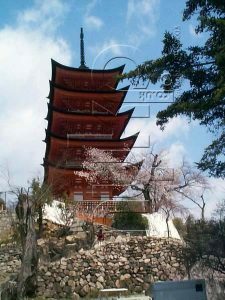 This has to be one of the most beautiful pagodas I´ve seen in Japan. See above picture. There are lots of other temples on Miyajima, as well as Mount Misen, from which you can see the bay of Hiroshima, but its a trek to reach the summit though. There is also an Aquarium here. Okay back to Hiroshima itself and the Peace Memorial Park, A-Bomb Dome and Museum. Firstly, if you are going to the Park and Museum, make sure you have a very open mind as there are something´s in the museum that aren´t for the faint hearted. My recommendation is to get off at “Genbaku-Dome-mae” as this is where the old town hall still stands (Basically its at one end of the park) although in a ruined state as the A-Bomb was detonated, directly overhead. This prevented the building from being blown to pieces as the blast hit the building from directly above. The building is in almost the same condition as it was after the bomb, although minor structural pieces have been added to stop the building falling down. The dome has been designated as a World heritage site and therefore the City of Hiroshima are charged with making sure that the building stays standing forever, no matter what the cost. This has been done as a symbol of Atomic War and Everlasting Peace. The area around the Atomic Dome is very peaceful, there are gardens everywhere and only pedestrians are allowed, even cyclists get off and push their bikes through the park. At the other end of the park, just less than a mile away is the memorial museum. This is one of the most disturbing places I have ever visited as it tells the story of the bomb, the dropping of the bomb, the aftermath and the long term effects on the city and the people of Hiroshima. What I was not ready for was as soon as you walk in you are presented with two large maps, a before and an after the bomb was dropped, to a scale of 2 kilometers. The before is littered with thousands of buildings and the after is just a black, charred mess with very few concrete buildings standing. Although it´s just a map if really gets the point across. The museum is on several levels and walking round will take a few hours. Be warned there are a few exhibits which will make you skin crawl and other stories of people who lived and died at the time of the bomb will bring tears to your eyes. This is well worth a visit, as you will not see things like this anywhere else, apart from Nagasaki (which is more graphic in its detail). Overall, I loved Hiroshima. It´s a new city with a long history with lots to see and do. The people can be a bit stand offish, and don’t be surprised if you get asked “American Jin?” (Are you American). Just say “iie, ingirisu jin desu” (Pronounced “e eh in gi ri su jin des), meaning “No, I am English”. You´ll see any animosity disappear. There is still tension between the Japanese and Americans in some parts of Japan.